For the doubters out there, Toronto’s housing landscape is proof that Darwin’s theory of evolution is, in fact, the real deal. As single-detached houses join the list of endangered species here in the 416, we’re seeing the emergence of new forms of high-density housing, made to survive this storm of rising prices and dwindling supply, all by virtue of their very design. What’s behind the housing crisis? Depends who you ask. Some cite population growth while others point the finger at overseas investors, NIMBYs or government policy. The latter, argues the home-building industry, has all but halted new single-detached development, straining existing supply and pushing prices ever higher. The CHBA report, The Housing Supply Deficit – Not Enough Homes for Families with Young Children, points to a significant and growing mismatch between housing demand and what home builders are able to supply, given planning and zoning patterns and the lack of available serviced land. The CHBA report carries with it a warning: if current trends continue, Canada will see a shortfall of 300,000 family-oriented homes in the next 10 years. In the meantime, prices continue to rise. The average single-detached home in the GTA increased to $1,205,815 in February 2017, according to the Toronto Real Estate Board (TREB). And you can expect prices to continue their upward trajectory, with an expected increase of 10 to 16 per cent this year, TREB predicted in its Review and Outlook 2017. This is on top of the 17-per-cent price growth in 2016. Again, it depends who you ask, but with no end to rising prices in sight, a necessary evolution is a likely outcome. And it’s already happening. According to one developer, the answer to the housing shortage is stacked townhomes, for a number of reasons. Cost is certainly one of them. “The fact that more units can be built and sold per acre allows all costs to be better distributed across a greater number of units,” says Joseph Alberga, director of sales and marketing at Lindvest. 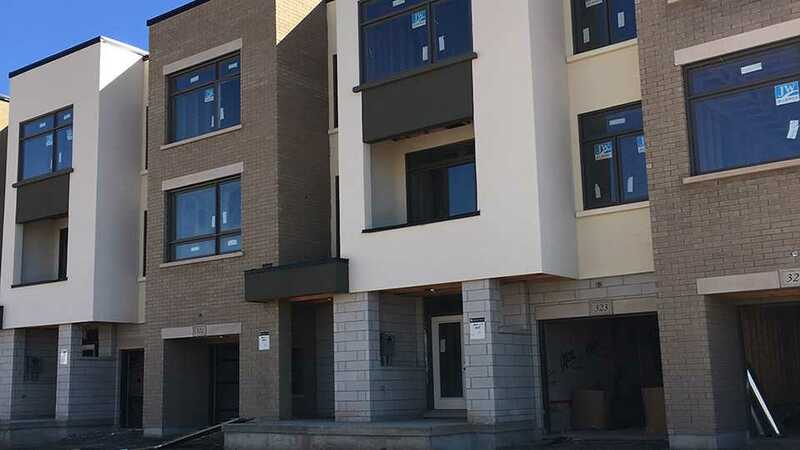 The developer is currently offering stacked townhomes at Brownstones at Westown in Toronto, and building Grand Cornell Brownstones in Markham, which is sold out. Cost savings include wood-frame construction no need for expensive elevators, and omitting amenities like pools. “All contribute to keeping the unit sale price more affordable, not to mention significantly reducing the shared monthly condominium maintenance fees,” Alberga says. Missing middle” homes, like stacked townhouses, are more complicated and expensive to build per square foot, explains Frances Martin-DiGiuseppe, architect and principal at Q4 Architects. This explains why developers haven’t showed much interest in them – until now. Ground-oriented, high-density housing is already a thing in Vancouver, which has been feeling housing price pains for some time now. “Laneway homes and stacked townhomes have been well accepted in Vancouver as a form of ‘gentle density’ as relative to higher density condominium housing forms,” says Bob de Wit, CEO of the Greater Vancouver Home Builders’ Association. “Laneway homes in particular have been very popular in the City of Vancouver proper, and now are beginning to roll out to the surrounding suburbs as land prices continue to climb. A great next step will be when cities begin to stratify and/or change tenure arrangements, so that homeowners can transfer ownership of laneway homes or carriage houses. That’ll open up wholly new opportunities for families to gain access to certain neighbourhoods.